Best-ever Rum Banana Bread recipe. This easy, quick, moist and delicious banana bread recipe with banana rum and walnuts is a keeper. Ever since I found this recipe at the back of the Gold Medal Flour packaging years ago it became my go-to banana bread recipe. I tweaked the recipe slightly by adding banana rum and cutting down on the buttermilk. What is amazing with this recipe you can add or replace any of the ingredients and it still comes out great. This recipe is so forgiving. Any banana rum brand will do but I used Bacardi’s Banana Rum. Over the years, I have tried many banana bread recipe but so far this is the best. Every time I make this I get lots of complements and many are asking for the recipe. Now the recipe is available on my site too. When making banana bread make sure to use very ripe bananas. It is way tastier especially with the added banana rum. The banana rum is optional. If you don’t have it follow the recipe and adjust the buttermilk to ½ cup instead of ¼ cup. Aside from walnuts I have made this with raisins, chocolate chips and pecan nuts. So get creative. 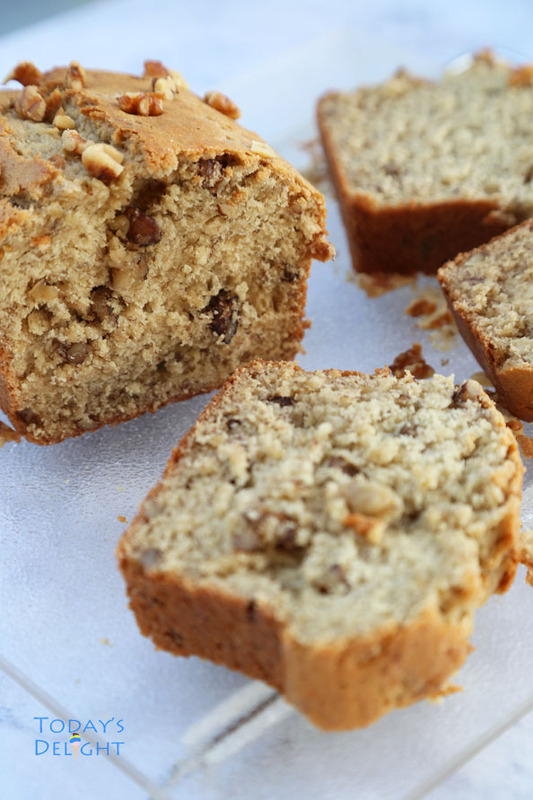 Making this Rum Banana Bread does not require a mixer. All you need is a spatula and mix it manually. 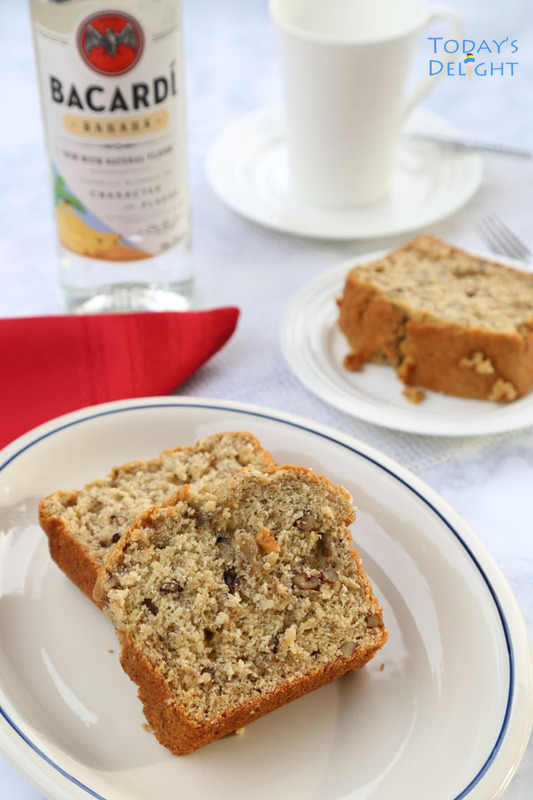 This Rum Banana Bread recipe is so good that you will keep making it. The holidays are around the corner and a good time to make it. Great as give away to family, friends and neighbors. Try this recipe and tell me how it measure up with your recipe. If you don’t mind, share your recipe if you think it’s better than this. I made this bread before we left to see “Hunter Killer”. If you love action movie this is definitely action-packed. I love Gerald Butler’s movies. The movie theater is ½ a mile to our house so instead of grabbing a bite somewhere else we decided to go home and have the banana bread. As soon as I opened the house door we were greeted with the sweet fragrant aroma of the rum banana bread. Oh it was so light, moist and delicious. Coffee and this bread is yum! Hope you like it too. Enjoy! 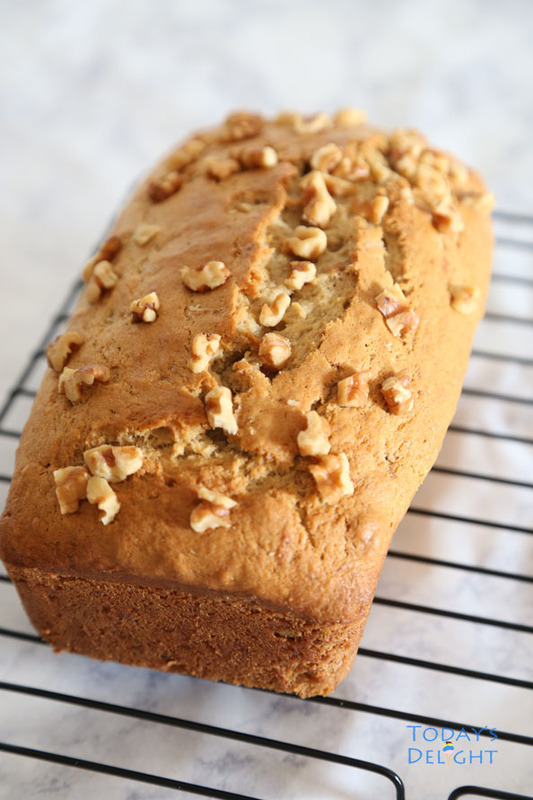 Easy, quick, moist and delicious banana bread recipe with banana rum and walnuts. Sift flour. Combine flour, baking soda and salt. Mix well. Set aside. Add soften butter and sugar in a large bowl and blend. Stir-in eggs and blend well. Add vanilla, buttermilk, banana rum, mashed ripe bananas and chopped nuts. Mix well. Slowly add flour mixture and blend well. Grease baking pan loaf with butter or olive oil. Bake 8-inch loaves about 1 hour, 9-inch loaf about 1 1/4 hours, or until toothpick inserted in center comes out clean. Pour batter and smooth the top. Bake at 350 deg F for 60 minutes. Note: Oven temperature may vary so adjust baking time accordingly. Cool for 10 minutes and transfer to a wire rack. Loosen sides of loaf from pan with a spatula. Remove from pan and place top side up on wire rack. Let it cool down completely.